Home / Scottish Brick and Tile Industry / Arrathill Clayfield, Templeton Farm, Near Old Rome, Ayrshire. 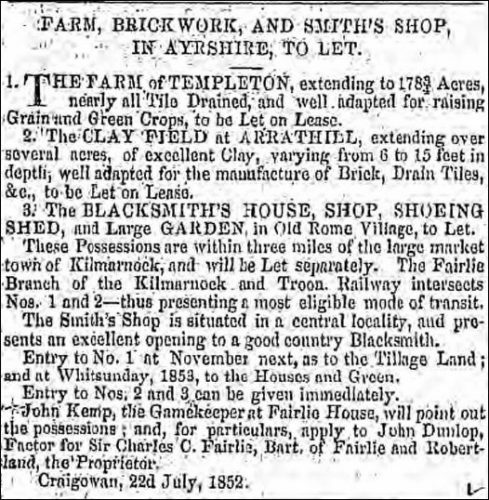 Below – 26/07/1852 – Glasgow Herald – Templeton Farm for let ….including the clayfield at Arrathill, extending over several acres, of excellent clay, varying from 6 to 15 feet in depth, well adapted for the manufacture of brick, drain tiles etc to be let on lease…. Next Article James MacFarlane, Brick and Tile Maker, Stirling.